/ Noise To Brain Adapter NTBA - leaf-audios Webseite! NTBA is out of production but a new version will follow! As the NTBA is quite complex, we recommend to listen the Soundcloud audio guide (below the text). 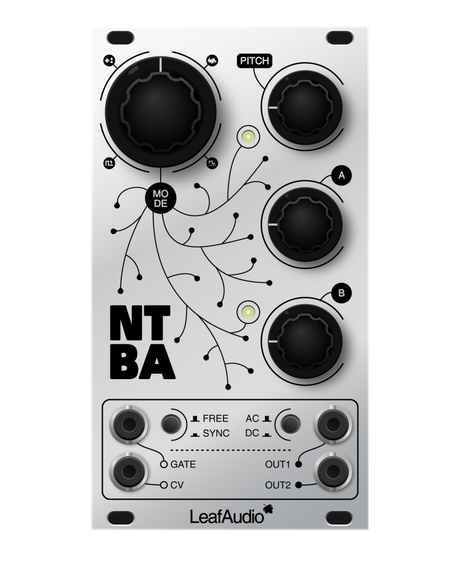 NTBA offers a lot of value for your money: Squarewave VCO, FM, Noise, S/H Tone Generator, Clock Switcher, Clock Divider, Trigger Cluster Generator, Random Trigger Clouds. A cheat-card with overview over all modes can be downloaded here and a SynMag review (german) can be downloaded here as a PDF. Besides our workshops NTBA can be purchased in our shop Exploding Shed (EU) or at Modular Addict (USA). DIY level: Medium. The NTBA DIY kit can be built by medium experienced DIYers in about 2-4h. After finishing it, the 1V/oct tracking and offset has to be adjusted, but it's easy. Powersupply: Like all Eurorack modules, the NTBA is powered by a symmetrical power of +/-12V. It has a current draw of max. 40mA. Current draw: 50mA at +12V / 16mA at -12V. Additional info: Unlike most DIY manufacturers, we produce our panels and circuit boards in germany. We also only use quality materials and durable parts. We hope that our customers appreciate and support that. The frontpanel was designed by Hannes Pasqualini / Papernoise.